A painting that was looted from a Ukrainian art museum during World War II and spent decades in a house in Connecticut is returned to the East European country, US officials said last week. 911 painting by Mikhail Panin entitled "Secret Departure Ivan the Terrible before the Oprichina" depicts the sixteenth-century Russian czar who escaped from the Kremlin on horseback. 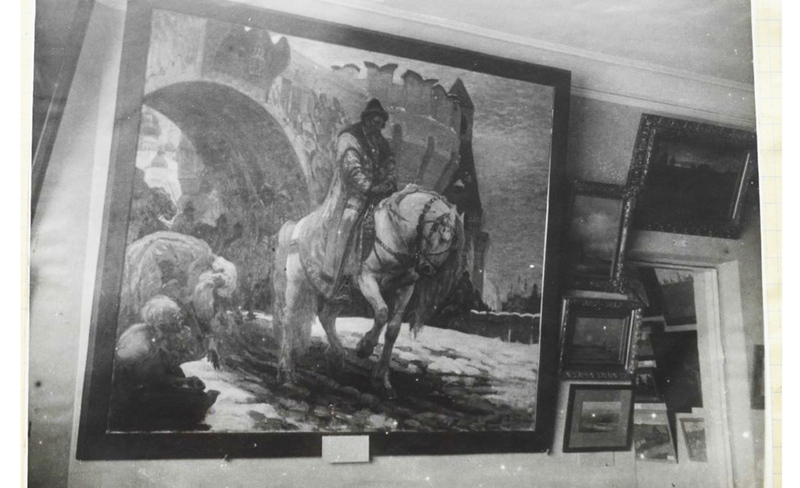 It was part of the permanent exhibition in the Dnepropetrovsk Art Museum in Dnipro, a center of the city of Ukranian, but disappeared sometime after the National Socialists occupied the city in 1941. The nearly eight-meter-tall plant was relaunched last year after a retired Ridgefield, Conn. A couple brought it to Washington to be auctioned there. The couple, David and Gabby Tracy, said the painting had come with a house that they had bought in 1962 from a Swiss. When the couple moved to another house in the area in 1987, they paid $ 37,000 to add a sufficiently large conservatory. View the painting.
"" This painting was a beautiful painting, and we appreciated it, "said Gabby Tracy, 84, opposite The Associated Press on Saturday "One could not help admiring the fine painting, the detail was in Ivan's face." However, when they made plans to move to a condominium in Maine last year, they realized that the painting did not fit and placed an auction with companies near Washington to sell the work, which was valued at about $ 5,000. After the auction house added the painting to its catalog, one employee received an urgent e – Mail from the Dnepropetrovsk Art Museum, which pointed out the origin of the work that it could not be sold. FBI officials took custody of the custody and followed it to the Swiss who owned the Ridgefield house in 1962 BC The officials did not release his name, but said he had gone to the USA in 1946 the Swiss Army. He died in 1986. Gabby Tracy said it was unknown how he got the painting, which the couple initially thought was a copy and not a signed original. After the Tracy couple had been stolen, the couple agreed that the painting should be returned to Ukraine. In particular, the story moved Gabby, who was born in Slovakia and survived the Holocaust. Her father, Samuel Weiss, died in a concentration camp. "It was never a question that it went back, it's only sad that we had to go back through this experience," said Gabby. "It's ironic that I must have been so worried about keeping this painting safe." Federal officials filed formalities on Thursday to hand over the FBI from the FBI to the US District Attorney's Office in Washington, which hands it over to the Ukrainian embassy. "The plundering of cultural heritage during World War II was tragic, and we are glad we could help endeavor to return such items to their rightful owners," the US said Attorney Jessie Liu in a statement from Friday. Representatives of the Ukrainian embassy thanked the Tracy couple and US officials who helped find the painting. A statement by spokeswoman Natalia Solyeva said it was the first time that the two nations had worked together to regain stolen cultural assets. "The Embassy of Ukraine was looking forward to working with its American partners if it would return the painting to its rightful owners – the Ukrainian people," the statement said.